For Ndidi Godwin, switching her children's education from a private to a public school has turned out to be a huge mistake. The Methodist Primary School, Ewu-Tuntun, which her two daughters attend has gradually - but steadily - become a shadow of itself over the past years. And there seems to be no succour in sight. "I removed them from private school and brought them here because I know what I got in a public school," said Mrs Godwin, who runs a shop near the primary school. "It's public school I went to in Lagos State. For primary, I went to Ajubiliee Primary school, secondary is Bolade Grammar School, then Lagos State Polytechnic, have I not achieved?" Established in 1953, the school with a pupil population of 374 consists of three buildings housing 18 classrooms. Ten of the classrooms are not in use while the remaining eight are in advanced stages of disrepair - no windows, broken ceilings, cracked walls, and tattered, leaky roofs. Methodist Primary School, Ewu Tuntun, is situated in Oshodi, a bustling community in the heart of Lagos popular for hosting major motor parks as well as housing hoodlums. About 10 kilometres from the school, the state government's ambitious multi-billion naira Oshodi Transport Interchange springs into view as the project enters its final stages of completion. The smell filters into the pupils' classrooms during school hours. "All the classrooms are in totally bad states, if you enter the classrooms, they smell like drainage," said Mrs Godwin. "No fence, no security for our children, even the classrooms are not good for learning. Many big people attended this school, in fact, there are many old students of the school living in this area, but nothing has been done. "We hope that the government will do something about the condition of the school." "There was even a time a classroom got burnt as a result of remnant of a cigarette left in the classroom. Bola Tinubu visited this place when that happened but nothing has been done about the school," said the parent who preferred not to be named. The office of the head teacher, a Deputy Director and a Grade Level 16 officer in the state's civil service, is not left out in the ruins. The Universal Basic Education (UBE), a Nigerian government initiative, replaced the Universal Primary Education and is intended to enhance the success of the first nine years of schooling in a child's life, starting with six years of primary education. The federal government through the UBE releases an annual grant which each state is expected to provide an equal amount of money as counterpart fund - a matching grant - before it could access the money. "We only have to attend to some schools while others will have to wait," Mr Sopeyin told PREMIUM TIMES, adding that the condition of the school, as well as the population, are some of the criteria SUBEB uses in selecting the schools for renovation. "Because of the situations in the country, we will not be able to get everything done. In spite of the rapport we have with NGOs, civil society organizations and so many societies, we will still not be able to have everything done." "We don't depend on the counter-part fund we receive from federal government, the state because of its passion for education also give fund for infrastructural development," Mr Akitoye said. 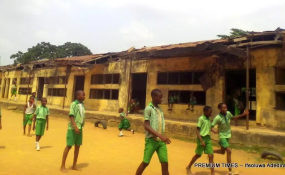 Recently, a teacher in the school told PREMIUM TIMES that SUBEB officials visited the school and took pictures of the buildings, but added that "this is not the first time, they do come but we have not seen any sign." For Mrs Godwin, whose elder child in the school is in Primary Five, the government's intervention is not coming anytime soon. She said she takes extra caution to protect her two daughters from the hoodlums who besiege the school premises daily. "They have to put on tights before they can enter that school because they are girls," she said. "Do you know how many times they have come from SUBEB that they will do the school? They will not come."